So you’ve joined the Guild Initiative, spearheaded an expedition into the jungle, and driven the Mordrem out of your guild hall. Congratulations! Now it’s time to start building up your guild hall and, by extension, your guild. You’ll be able to build six major structures around your central hall. Each is run by a proprietor—an expert from the Guild Initiative who is on loan to your guild indefinitely to help you maintain your presence in the area. Proprietors will have a set of upgrades you can purchase that will add various functionalities and services to your guild hall. These upgrades will cost your guild three resources to purchase. First, you’ll need various crafting materials, specific to each upgrade. Out on the frontier, supplies that can be used in your guild hall or shipped back to Guild Initiative Headquarters to support research are much more valuable than gold. These materials will need to be donated to your guild’s treasury, a special new repository, before they can be used to purchase upgrades. Second, you’ll need favor, which is earned by running guild missions. Favor is a measure of the Guild Initiative’s trust in your guild, as well as the general goodwill that your guild enjoys from the people of Tyria. We’re changing the way guilds access and run guild missions—you’ll no longer need to unlock them, and they’ll award your guild with favor instead of merits (we’ll cover this in more detail in a future post). Commendations will still be awarded to individual guild members for helping to successfully complete a mission. Finally, you’ll need aetherium. This is a precious resource that can be mined from one of the main structures you’ll be building—or digging, rather. It’s essentially raw aether that is processed out of deposits from the stone in your guild hall. 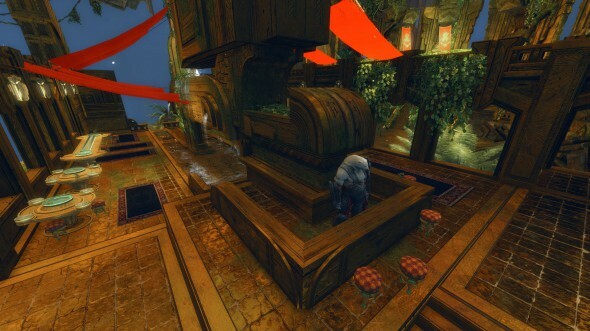 These deposits are extremely rare in Tyria, making your guild hall a very valuable find! Aetherium will be generated automatically over time by miners working in your guild’s mine. You’ll be able to upgrade the rate at which the aetherium is generated as well as your capacity to store it. When we examined the current system to see what could be improved, we decided to iterate on the way guild unlocks are handled. Using time to gate unlocks is important to pacing the rate at which the biggest guilds move through progression, but we realized that we could front-load it so that you’re not working for an upgrade, spending the resources, and then delaying gratification for up to three days. Instead you’ll be depositing the relevant materials, saving up favor, and mining aetherium. When you’ve got enough to purchase the upgrade, there is no delay—your guild will have it instantly and permanently. We’re also moving away from the four disciplines and research levels. Each guild hall has an associated guild level that will measure the guild’s progress in building the hall. As you build, you’ll gain levels, and new upgrades will become available for purchase. If your guild has already unlocked the research level that grants access to a given upgrade in the current system, you’ll be grandfathered in so that you keep what you’ve earned under the current live system. First is the tavern, which is associated with socialization and effects. As a new proprietor, you’ll come here to rest until you’re ready to start constructing buildings. One of the upgrades you’ll be able to unlock through the tavern is the ability to choose an anthem for your guild. This will play for all to hear during moments of triumph, such as when you complete a guild mission or claim an objective in World vs. World. Second is the mine, which is the source of aetherium discussed above. All of the upgrades for this structure will relate to the generation and storage of aetherium. Third is the workshop, which is associated with crafting and gathering. Here, members of your guild can train in the new guild-specific crafting profession, scribing. We’ll discuss this more in a future post in this series. Fourth is the war room, which is associated with WvW. You’ll be able to unlock scribing recipes here for use in the updated guild claiming system. Fifth is the market, which is associated with finance and mercantilism. Through this building, you’ll be able to unlock a new tier of guild weapons and armor for your weaponsmith and armorer. Sixth is the arena, which is associated with personal combat and Player vs. Player. Once your arena is fully built, you’ll be able to use it as a combat sandbox and customize it with obstacles and traps. That’s our introduction to building up your guild hall! 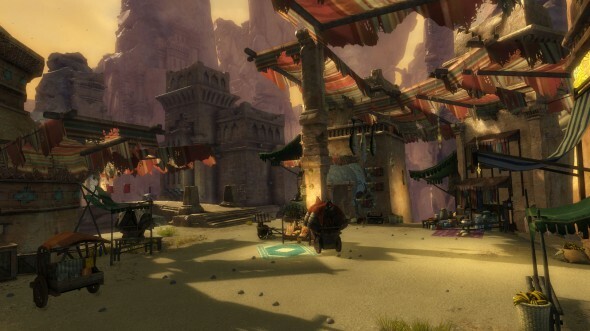 In the next post in this series, we’ll look more closely at the changes Guild Wars 2: Heart of Thorns™ will bring to the guild system as a whole.